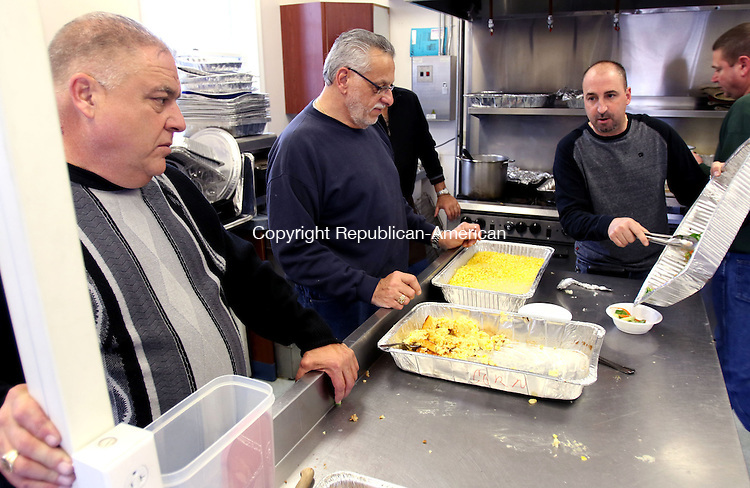 TORRINGTON CT. 26 November 2015-112615SV11-From left, Walter Sherman, Bob Teixeira and Carmen Gianni all of Wolcott serve turkey dinner at the Senior Center in Wolcott Thursday. The dinner was offered to Wolcott residents and senior center members who otherwise might be alone on Thanksgiving. Deliveries were made to residents who cannot attend. A team of volunteers has cooked over 30 turkeys, along with gravy, potatoes, sweet potatoes, corn casserole, green bean casserole, turkey soup, appetizers and many desserts.